President Obama has talked openly about being abandoned by his father as a child. He last saw his dad when he was 10. President Obama says his most challenging and important role is "to be Sasha and Malia's father"
Obama described his father as "a tragic figure"
Obama vowed if he became a father to "be a presence in my children's lives"
Washington (CNN) -- The day after official Father's Day festivities, President Obama used his bully pulpit to stress the importance of responsible parenting at events in Washington. The commander in chief, or perhaps father in chief, said Monday that, "without hesitation, the most challenging, most fulfilling, most important job I will have during my time on this Earth is to be Sasha and Malia's father." On Father's Day 2008, Obama took a more pointed tone when delivering a controversial speech on fatherhood. Before a predominantly African-American audience, then-candidate Obama chastised absentee fathers, specifically addressing black men in the community, saying, "We need fathers to realize that responsibility does not end at conception. ...Too many fathers are MIA, too many fathers are AWOL, missing from too many lives and too many homes. They have abandoned their responsibilities, acting like boys instead of men." 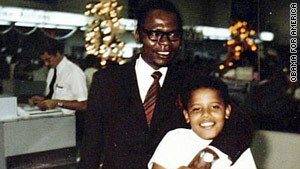 Obama continues to talk openly about being abandoned by his father as a child. During my interview with him in July 2008, the candidate unleashed the kind of raw emotion, insight and color we rarely see from him today as president. Suzanne Malveaux: Your father was largely absent, how did that impact you? Barack Obama: Well, you know, I think it had a profound impact except, you know, more as an object lesson of what it's like growing up without a father in the house. My father had a reputation of being this larger than life figure: charismatic, very smart and very engaging. And all of those things were true. He was part of that first generation of Africans who moved West to get an education and intended to bring it back to develop their country. And he made a great impression on people, but he also was a tragic figure not only because he didn't stay with my mother and me, but he generally had trouble providing stability for his other children and his subsequent wives. And he was somebody who was incredibly brilliant, but also because of the tensions from leaping from a small African village to Harvard and being part of this modern world, he never resolved those tensions. He fought, when he got back to Kenya, against tribalism and nepotism, but was ultimately consumed by it and blackballed from the government, ended up having a serious drinking problem, was in a severe car accident and ended up dying a tragic and bitter man. So when I think about his impact on me there are some superficial things. He went to take me, when I was 10 years old, to see a jazz concert, and I became a real jazz buff after that. He gave me my first basketball, and it was only later that I realized that that had been the case and might have been part of the reason why I became so obsessed with playing basketball. But for the most part what I understood from him was an absence, and I vowed that when I became a father one of the most important things that I could is be a presence in my children's lives. Malveaux: That visit when you were 10 years old at that time -- was there anything in your 10-year-old mind that you thought you could do to get him to stay? Obama: No, I don't think that's how 10-year-olds think. If you've got this person that suddenly shows up and says, "I'm your father and I'm going to tell you what to do," and you don't have any sense of who this person is and you don't necessarily have a deep bond of trust with him. I don't think your reaction is how do I get him to stay? I think the reaction may be, what's this guy doing here? And who does he think he is? So it was only during the course of that month, by the end of that month that I started to open myself up to understanding who he was, but then he was gone. I never saw him again. That was the last time I saw him. He would write to me occasionally. He wrote me letters, and we would talk on the phone intermittently, but it was not until I traveled to Kenya and heard from relatives of who he had been and the story that he had lived that I think that I fully was able to understand him and obviously in some ways understand myself. Malveaux: You said, "Every man is trying to live up to his father's expectations or make up for his mistakes and in my case both may be true." Can you explain? Obama: If you don't have a father there, it means you're always grappling against this image that you don't fully understand. If you have a father in the house, you're going to have arguments; there are going to be tensions, you're going to see his flaws but also see his good qualities, and so there's something very concrete against which you can learn from and match up to. In my case, you had this person who was almost a myth in our family about how smart he was, about how well he did in school, how well-spoken he was and so forth. So that was something to live up to -- high expectations. On the other hand, here's somebody who wasn't there and that I would come to learn was an alcoholic and somebody who had not treated his family well. So that was something that you felt that you had to make up for. And I think that certainly in the early part of my life grappling with that legacy was part of who I was and is still part of who I am.